Five hardy souls ventured out in the aftermath of the “Snochi” snow storm to read and share poetry during the Second Friday Poetry Reading: Valentine’s Day Edition at the Berkeley Art Works. 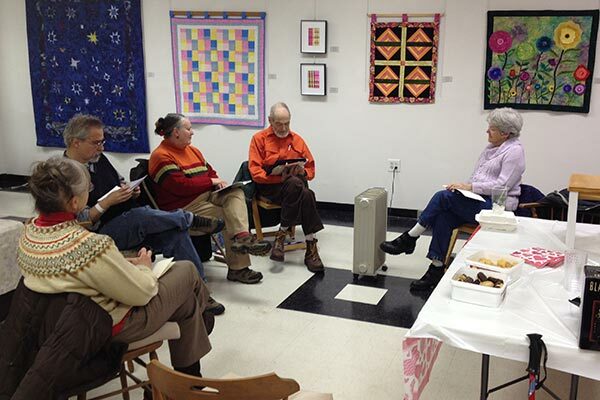 The poetry was read and enjoyed among the quilts and fabric art of the “Connecting Threads” exhibit, which was installed this week. There will be an reception for the exhibit Saturday, February 15 from 5-7pm at the Berkeley Art Works, 116 North Queen Street in Martinsburg. The Berkeley Art Works, a project of the Berkeley Arts Council, is the realization of the long-held dream of the arts community in Martinsburg and Berkeley County West Virginia: to have a community-based arts facility that supports local and regional artists, brings quality arts experiences for the members of the public, and provides a wide range of arts learning experiences for local residents, artists, and artisans. The Berkeley Arts Council is on the Web at www.berkeleyartswv.org.